Setting up staging laparoscopy. 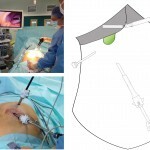 The laparoscopic monitor is placed beyond the patient in the direction the surgeon is working (A). 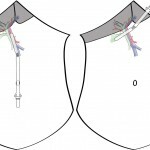 The laparoscopic ultrasound machine is placed to the left of this. An assistant is controlling the laparoscopic camera while the primary surgeon manipulates the ultrasound probe. Note the remote control unit for the ultrasound machine in the surgeon’s left hand with which he is recording images and turning the Doppler flow on and off. There are many options for port placement and this is our preferred (B). A pneumoperitoneum is established through an infraumblical port inserted with an open technique. A further 10-12 mm port is placed in the epigastrium to the left of the midline and well below the costal margin. A 5 mm port for a grasper is placed in the right upper quadrant. Staging laparoscopy. 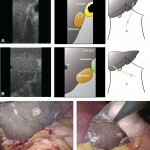 Begin with a full inspection of the peritoneal cavity lifting the left and right liver to view the underside (A) and paying particular attention to the peritoneum (B). Use laparoscopic ultrasound to orientate on the origin of the left and right portal vein branches and carefully visualise the parenchyma of the right lobe (C). Look on the left side of the falciform ligament and scan segments II and III. Place the probe on the hepatoduodenal ligament in the transverse plane to examine the portal pedicle (E). The probe can also be placed on the underside of any part of the liver and orientated anteriorly (F). Adhesions around the gallbladder can be seen as a result of recent acute cholecystitis. 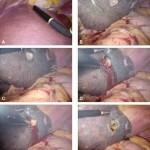 Staging laparoscopy in patient with a head of pancreas mass. A small lesion had been seen in the right liver on CT and MRI but was too small to characterise. 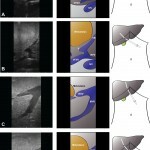 At laparoscopy a lesion was seen in segment II/III of the liver (A) and segment V (B). These looked suspicious and on biopsy with frozen-section analysis, the left-sided lesion was confirmed to be adenocarcinoma (C). Laparoscopic ultrasound and biopsy of suspicious liver lesion in patient with head of pancreas mass. 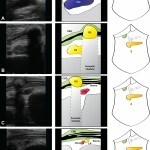 The lesion is identified with the ultrasound (A) and visualised (B). Using scissors without diathermy (C), the lesion is excised and subjected to frozen-section analysis (D, E). Diathermy is used to achieve haemostasis (F). Laparoscopic ultrasonography in patient with large colorectal liver metastasis at the hepatic outflow. As the probe is moved up towards the suprahepatic vena cava, a large metastasis can be seen sitting between the right and middle hepatic veins. 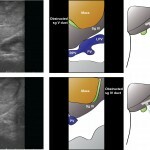 Intraoperative ultrasonography to determine relationship of large colorectal liver metastasis to vascular structures. Patient with a suspicious liver lesion which on LUS is demonstrated to be an intrahepatic gallstone. Benign and malignant lesions can be difficult to differentiate in the biliary tree, as a number of case reports of similar instances describe. 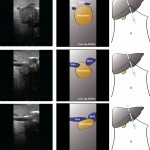 Anatomy of the extra-hepatic biliary tree with typical transverse ultrasonographic planes through the portal pedicle. The right hepatic artery (RHA) usually runs behind the common hepatic duct (CHD), with the origin of the cystic artery (Cystic A) being variable (A). An important variant is an accessory right hepatic artery (aRHA) arising from the superior mesenteric artery present in 15% of patients (B). The superior mesenteric vein (SMV) / splenic vein (SV) confluence is tear-shaped and often easy to identify (C). LHA, left hepatic artery; PHA, proper hepatic artery; CHA, common hepatic artery; GDA, gastroduodenal artery; CBD, common bile duct. 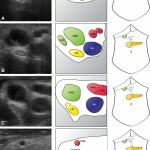 Ultrasonography of the portal pedicle starts with identification of “Mickey Mouse”, formed by the larger portal vein (PV) sitting posteriorly with the common bile duct (CBD) and proper hepatic artery (PHA) in front. Transverse views of portal pedicle in patient with biliary obstruction. A full description is provided in the main text. A dilated common bile duct (CBD) is followed up with the portal pedicle (A). The arterial anatomy is clearly seen (A-D) and two plastic stents can be seen within the common hepatic duct (D). 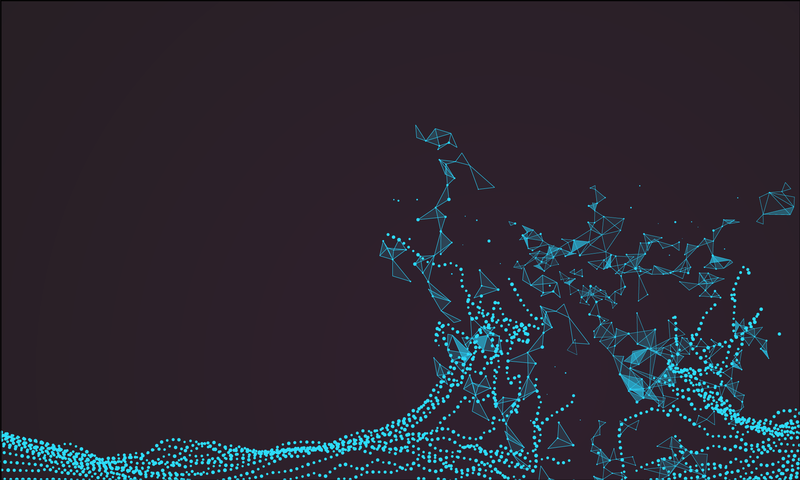 Also see accompanying video. GDA, gastroduodenal artery; PV, portal vein; CHD, common hepatic duct; RG, right gastric artery; CyD, cystic duct; LN, lymph node; PHA, proper hepatic artery; CHA, common hepatic artery. Malignant obstruction of the biliary tree. An indistinct mass is seen in the head of the pancreas with dilatation of the pancreatic duct (PD) and a metal stent in the common bile duct (CBD; A). The confluence of the superior mesenteric vein (SMV) and splenic vein (SV) becomes the portal vein (PV) which can be followed beneath the neck of the pancreas. 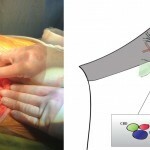 Both the vein and the superior mesenteric artery (SMA) appear free of tumour. Longitudinal views of portal pedicle in patient with biliary obstruction. The neck of the pancreas can be seen with a visible but non-dilated pancreatic duct (A; PD). 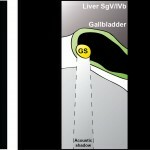 A large gallstone (GS) is seen in a thickened common bile duct (CBD) (note the prominent acoustic shadow). Stents can be seen in the CBD (C) extending below the level of the stone (D). 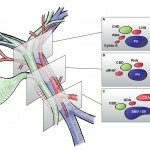 SMV, superior mesenteric vein; PV, portal vein; LN, lymph node; CHA, common hepatic artery. Segmental obstruction of biliary tree by large hepatocellular carcinoma (HCC). Obtaining longitudinal (left panel) and transverse (right panel) views of the portal pedicle through a 10-12 mm umbilical and epigastric laparoscopic port. Laparoscopic ultrasound examination of gallbladder described as suspicious on pre-operative imaging. 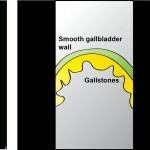 The gallbladder is seen to be smooth and relatively thin-walled, with multiple gallstones present within the lumen. No infiltrating lesion was seen.